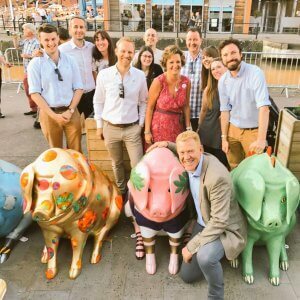 To help celebrate SF Planning’s new Gloucester office, we are proud to be sponsoring the Three Counties Henson Pig Trail. Marketing Gloucester have been working with the Royal Three Counties Show team to develop the trail. The aims are to encourage a better understanding of Gloucestershire’s rural heritage, promote cultural tourism in the county and raise money for local charities. The Gloucestershire Old Spot has been chosen, and starting this week, they will be popping up all over the city and beyond. There will be twenty statues of the pigs dotted around the city with an additional twenty around the county. Each figure is roughly a metre high and decorated by well known local personalities and schools. Look out for SF Planning’s pig – the Roman Emperor Nerva. Gloucester was founded by the Romans in AD97 under Emperor Nerva, so you could say that Nerva was Gloucester’s first town planner! The trail is named after the Cotswold Farm Park founder, the late Joe Henson. Some the staff at SF Planning had the pleasure of meeting Joe’s son, Adam Henson at the launch of the trail recently. The ‘Old Spots’ will be in Gloucester from June to August 2017 and we are expecting our ‘Old Spot’ Nerva to land in the city centre any day now so please tweet your photos with the hashtag #sfpNerva. Maps of the trail can be found at local tourist information offices and more info online at the Facebook page.